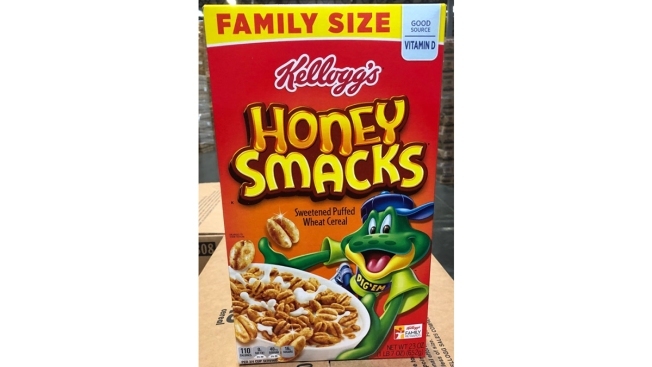 Despite popular Kellogg's cereal Honey Smacks being linked to a salmonella outbreak that has infected 100 people in 33 states, the Food and Drug Administration says some boxes are still sitting on store shelves after a wide-ranging recall. Kellogg's had issued a voluntary recall in June for the cereal that was distributed across the U.S. It initially recalled certain sizes of Honey Smacks packages with specific code dates. However, the FDA said Thursday that some retailers are still selling the cereal despite the recall, which the agency said affects all Honey Smacks packages. The FDA reiterated that "retailers cannot legally offer the cereal for sale and consumers should not purchase Kellogg’s Honey Smacks cereal." The CDC found salmonella in Honey Smacks samples and told customers Thursday that they should avoid all Honey Smacks, tweeting, "Do not eat this cereal." The agency advised people to stop eating the cereal and throw it out, regardless of its package size or expiration date. It also advised retailers to stop selling and serving all Honey Smacks. The CDC says at least 100 people have become sick between March 3 and July 2 in Massachusetts, New York, Pennsylvania, Maryland, Virginia, Florida, Illinois, Texas, California and other states. At least 30 of those people have been hospitalized. Most people infected with salmonella develop a fever, cramps or diarrhea within 12 to 72 hours of being exposed to the bacteria, according to the CDC. The FDA found that the salmonella was traced back to a third-party manufacturing facility. The facility is no longer producing Honey Smacks as of Thursday, the agency said. "We continue to work with the FDA and the third-party manufacturer to determine how this happened to ensure it doesn't happen again," a spokesperson from Kellogg's said in an email to CNBC. "Kellogg is asking that people who purchased potentially affected product discard it and contact the company for a full refund."